DC: If you can, see it while it's here in DC at the Kennedy Center. You may be able to get tickets from their box office (for possibly best prices) or online. Limited availability online, and those that were available were mostly Orchestra (@625) and First Tier (@500). You can also enter the daily lottery. Tickets are offered through their app and online, in the first three rows of each performance. The price? A very Hamiltonian $10/ticket, of course in the US and 10 pounds in London. To learn more, CLICK HERE. That can be used for the lottery in other cities as well. Tickets are being released daily for upcoming performances. Standing room may be available on a performance by performance basis, beginning two hours prior to the curtain time. When available, standing room may only be purchased in person at the Kennedy Center Box Office. Tickets are $49 each, limit 2 per person. How to get in the mood? Maybe go by Hamilton's statue in front of the U.S. Treasury Department, or have a meal at The Hamilton, 14th & F Sts., NW (part of the Clyde's Restaurant Group). Other cities: Here's more information about Chicago, and stops at many other cities. (We saw it in Cleveland; SOLD OUT, and amazingly enthusiastic crowd for the phenomenally talented cast and crew, not a motley one by any means) CLICK HERE to learn more. Here's a brief excerpt: The award-winning musical has been selling out on Broadway since it opened to rave reviews in August 2015. 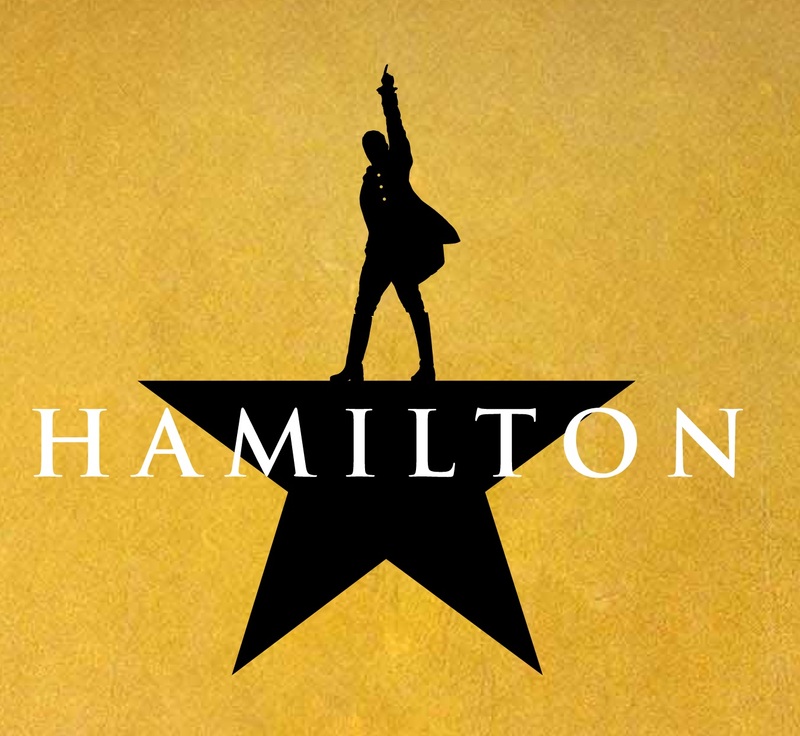 Hamilton, which features book, music and lyrics by creator Lin-Manuel Miranda, went on to break records and win 11 Tony Awards, as well as a Grammy and a Pulitzer Prize. Listen to the music on the 2 CD set, read the incredible Alexander Hamilton book by Ron Chernow that inspired Lin-Manuel to create the show. Read the Time-Life book about the Founding Fathers. It is also beneficial to read the annotated libretto, Hamilton: The Revolution, with witty comments by Lin-Manuel and others. Is there a Cliff's Notes version of Chernow's incredible (but long) bio? I don't know. I read the book and listened to the amazing music and lyrics....worth the time and effort! And the show? Worth every penny (lower prices than in DC). On a visit to New York City, you may want to visit the Smithsonian-managed Museum of American Finance, 48 Wall Street. Unfortunately, it's currently closed for repairs. But also many other historic sites in and near New York City, and you'll see some of them in the PBS Special. Honors: Finally, Lin-Manuel Miranda and three of his major collaborators will be honored on Saturday, December 1, 2018 at the Kennedy Center, with special awards as part of the Kennedy Centers Honors. Those tickets are even harder to obtain than the show. Good luck! And whatever you do, to paraphrase the words of Hamilton songs: Don't give up your shot to be in "the room where it happens"! !